It was a spring day in 2000 when Sam Crosby, DVM, got an emergency call at about 11:00 a.m. It was March and foaling season, so a dystocia (difficult foaling) was not unusual for Crosby, whose equine practice is based in Arcadia, Okla. When he arrived a few minutes later at the client’s farm in a small town near Oklahoma City, his equine patient was in a large outdoor pen. The mare, a stout, heavily-muscled, foundation-bred Quarter Horse, was on her feet with the head, neck and two forelegs of her foal presenting. The foal’s shoulders were firmly stuck in the birth canal. 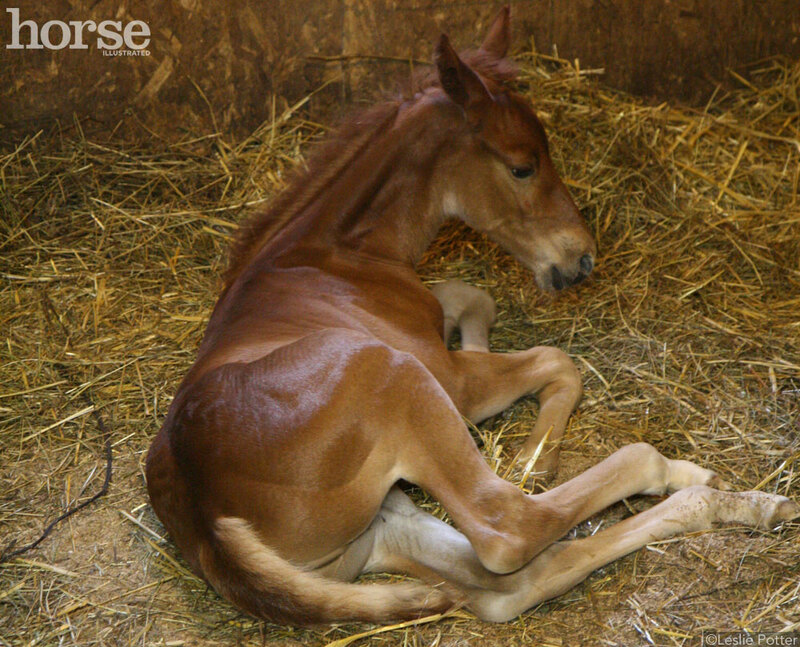 Without immediate help, both mare and foal would likely die. Crosby quickly donned an obstetric exam glove and reached inside the mare, but was unable to move the foal. He took the glove off, got a good grip on the foal’s front legs and pulled downward, but the foal still would not budge. Time was of the essence. Crosby suddenly remembered the “calf jack” in his truck. A long aluminum bar with a brace, ratchet and obstetric chains, it’s made to help deliver calves. The brace fits snugly against the cow’s hindquarters while the smooth obstetric chains fit around the calf’s forelegs above the hooves. As the ratchet is gradually tightened, pressure helps ease the calf out of the birth canal. “I don’t normally carry a calf jack, but I had it with me that day, and this foal was hung up badly,” recalls Crosby. With the mare’s owner standing at her head to control her, Crosby sedated the mare and put the calf jack in position. He braced it firmly against her hindquarters and attached the obstetric chains to the foal’s forelegs. Just as he was taking up the slack and beginning to use the ratchet to apply pressure to the chains, the mare owner let go of the lead rope and walked behind her to see how things were progressing. Although the mare was sedated, she wasn’t happy about what was happening. Lead rope dragging, she staggered off with the owner running alongside trying to catch hold of her. “The pen was about the size of a riding arena and had a number of trees,” says Crosby. “Even though the mare was tranquilized, she was still stumbling along pretty quickly. I was trying not to hit a tree and not let go of the jack. She went about 75 to 100 yards with me running along behind before she started slowing down.” The mare stumbled and fell to the ground at the same moment her foal finally slipped out. After making sure the foal was breathing well, Crosby treated the mare with banamine, oxytocin and penicillin. He again donned an exam glove and checked to be certain there were no pieces of retained placenta. The foal required no special treatment. Despite the traumatic birth, both mare and foal recovered without incident.